I can’t say that I ever remember two icons passing on the same day before. Certainly Farrah Fawcett did not fall into the same class of icons as Michael Jackson – not many people do, but nevertheless she was as an iconic part of the 70’s as anyone. Yes, I did have that famous poster hanging on my wall – as did millions of other young men back in the 70’s. I’m sure that millions more will admire her for the courage that she showed during her illness. She will be missed. I guess there is a lot more to be said about Michael – of which I’m sure there will be many books, movies, TV mini series and who knows what else coming down the pipe over the next few years. I’m reminded from a line in the movie “The Birdcage” where one of the news media say’s “we are in enquirer heaven”. This story is likely to go on and on for many years to come. Although it’s way to early to tell, I did hear one report that Michael left Paul McCartney the rights to his share of The Beatles catalog in his will. For those of you who did not know, Michael Jackson still owned part of the The Beatles catalog which he had purchased back in the 80’s. If indeed that is the case, talk about karma coming back around. We shall see. 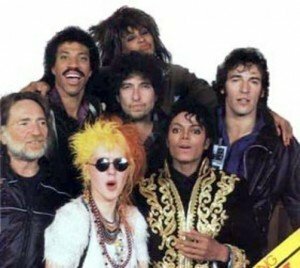 Yes, Michael Jackson was well known for his eccentric/crazy behavior over the last thirty years, but I prefer to remember his other side which was capable of writing a song like “We Are The World”. I don’t know why, but that’s the first thing I thought about when I heard the news yesterday. I had not heard the song or watched the video for many years, but the first thing I did when I woke up this morning was to click over to YouTube to check it out. Seeing it again was a reminder of what good us humans are capable of – when we are not so busy killing each other. This is how I prefer to remember Michael. There are dozens of versions of the song and video on YouTube to choose from, but this version stood out because of the editing and background music that was inserted. Kind of erie in a way. Brought me right back to 1985 – when the world was a much different place. No – i don’t like the version without the music. It brings back visceral memories, and I wish someone would release a new DVD of We are the World, Heal the World, and the segments on making both of them. I would pay a lot of money for a digitally remastered DVD, and I’d bet a lot of people would. Quincy Jones, are you listening? Why not? WATW is a historical recording. Never before or since have there been so many stars in on one project. The level of collaboration is staggering, and the room is so bright with stars that we blink in disbelief when they pan across this bright stage. It is a collaboration of Rock, Country, Soul, Jazz, Rap, and everything in between. And it is just being discovered by people who weren’t born when it was made. PLEASE QUINCY – Please reissue an official version. Those YouTube videos are sadly worn. I’m sure you can still give proceeds to USA for Africa… or hell, change it to USA for America! But let’s do this! proton on How Do I Download Sounds? Tseku Hope on How Do I Download Sounds?